During my six years here I have hinted that the day would come when Mission Churches would be closing... including the closing of Our Lady of Lourdes Church. Just recently came news that it would happen in June 2017. This will change the dynamics of both St. Aloysius and Our Lady of Lourdes. Fr. Davis will be the Priest Administrator of both Enumclaw and Buckley, and Fr. Clarence Jones will live here in Buckley. The closure of a church isn't an easy subject, particularly to those who are losing their spiritual home. 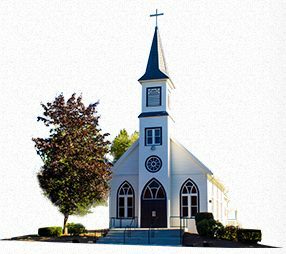 But it is something being talked about more and more as church closings are becoming an increasingly regular occurrence ------ some estimates are nine a day in the United States. I want to urge members of both Churches to be gracious and forgiving to ME and to the Archdiocese during this time of change. I want to invite you to an avoidance of bitterness and gossip, and an embrace of forgiveness and gratitude. God often changes the plans for his people. Our Lady of Lourdes closing could be looked at as a new opportunity to find and do God's will. But are Christians even capable of such a spiritual perspective, and feeling such positive emotions, when faced with something as demoralizing as what is happening in the changes. But yes ---- you can be grateful when your church is no longer going to be what it had been to you. None of St. Paul's churches still meet on Sunday morning. Any sense that our churches were permanent was a misunderstanding of the Catholic church. What scripture passage, if any, illustrates this situation? 1 Chronicles 16, where David says ---remember the wonderful works God has done.---- That is a farewell to a church, or it can be. The three points for any closing sermon I want to emphasize are remember, be grateful and imagine. My role today is almost to be a hospice chaplain, it's to care for you through this difficult time and to help you recognize that the end of your life is not the whole of your life. There are ministers for whom the pastoral care becomes the center of their ministry. 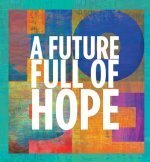 But even in those situations, we need to keep pointing to a bigger hope, a more eternal hope a future that's bigger than Mount Rainier. I encourage you to envision a new calling. There are churches that have chosen at the end to be true to who they are. They sell their property and give it to something they believe in, and then go join another church and make it stronger. If I could only say one thing to the parishioners of Lourdes today, I'd say this: you did nothing wrong. And if I could say a second thing it would be this: God is not done with you. 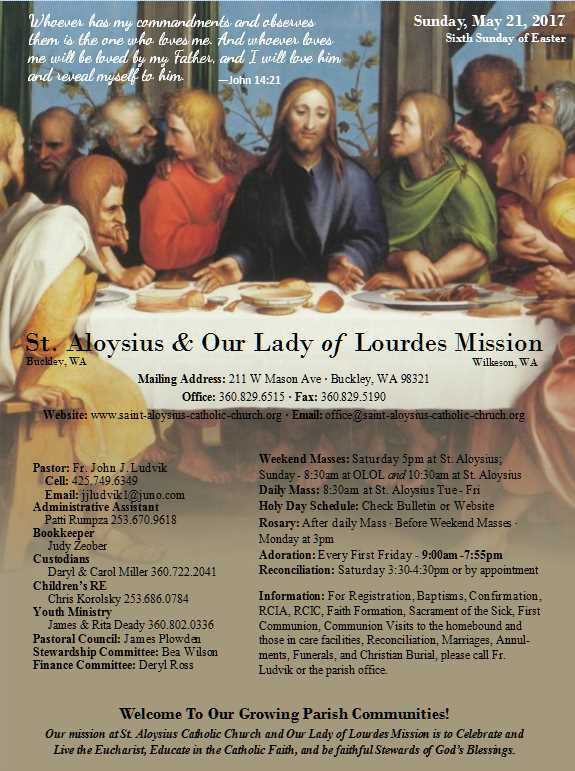 To the people of St. Aloysius I ask you to open your hearts to the parishioners of Lourdes. Two representatives from the Archdiocese and I met with, I believe 6 parishioners, from Lourdes last Wednesday evening. That is when it was announced officially that Lourdes was going to close. They had many questions, and I was under the impression that one of the people from the Archdiocese was going to share with our parishes today this news so I didn't take even one note. Like those present I have been overwhelmed since I heard this but I decided instead of July 1 with the changes, that I should be present for the closing which will be June 18th. We will have a closing liturgy and at St Aloysius I hope to somehow include all parishioners in this event. On June 22 I am leaving the parish and then on June 25th the 8:30am Mass will no longer be at Wilkeson, it will be celebrated at the same time, but from now on at Buckley. Fr. Paul Wichert, a Benedictine from Lacy will preside at the liturgies that weekend and the first weekend of July one of the new priests will be present. Both Enumclaw and Buckley will remain as parishes. Buckley will not be a Mission. In days ahead decisions will be made whether the church becomes a station. It would just stand there but would not be used, or it could be sold and the monies from the parish could directly come to St. Aloysius or provide for sustaining the Station Church, or some of the monies could also provide a better fund for the care of the cemetery which will continue to be cared for by St. Aloysius. In the opening line of this reading, Jesus could just as well have said, "If you love me, you will love what I love and want what I want." Keeping his commandments is a matter of the heart, a heart willingly invaded by God. At the meeting this Wednesday evening I was not taking notes and don't remember what all was shared. A transition team is being formed to move into the future and I am like kind of a 5th Wheel, and just ask you to work together for the transition, to build up two communities.